I (Evander) am no apologist for big-salaried baseball players. I have good friends in St. Louis, and in fact, uncharacteristically, pulled for this National League team during the 2011 World Series. So, I feel your pain Cardinals fans. But Albert Pujols, who becomes the second-richest player in major-league history (after Alex Rodriguez of the New York Yankees), has done what he had to by signing with the Los Angeles Angels of Anaheim. While the rest of the world plays the sport with a DH, the N.L. sticks to the old style of pitcher-batting and late-inning double switches. Mid-career and aging stars like Pujols know that they can find a home in the American League as a part-time DH initially, and probably a full-time DH in late career. Pujols also now prepares to stand astride the second-largest media market of North America. Who could blame him? This entry was posted in Baseball, Yankees and tagged Albert Pujols, Alex Rodriguez, American League, Los Angeles Angels of Anaheim, National League, New York Yankees, St. Louis Cardinals. Bookmark the permalink. I hear you and we at ROTB feel your pain. A dear friend (terrific poet and translator) came to precisely the conclusions you did. 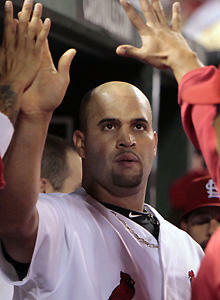 It is difficult for mere mortals to put themselves (ourselves) in the shoes of Pujols. Yet, I cannot imagine there are too many major leaguers, or stars within this universe, who disagree with such a free-agent move. Another Cardinal, who probably will never be in the Baseball Hall of Fame but had an impact on a Ruthian level, named Curt Flood, has to be smiling. Emotions and sentiment are always intense of course. But if the St. Louis Cardinals, whose owners control a lot of the beer that flows thro the veins of professional sports in the United States, would not match the offer, one may ask why.